They billed it as The Last Waltz, Catchy. An attractive logo for posters and T-shirts. A great title for a movie. The Band's farewell to live performance. In Panavision. The most awesome assemblage of rock's nobility since the Woodstock mudbath. It happened as it had been foretold. Port-o-sans and peanuts maintained the lucky 5,000 who lined up outside Winterland on Thanksgiving. Carnations adorned the spiffy and the scuzzy alike. Two hundred and fifty turkeys went under the knife. Narsai's did the catering. At $25 a ticket, this certainly wasn't St. Anthony's. Thankfully, it wasn't the Venetian Room, either. Our Dutch uncle, Bill Graham, reportedly took a financial bath to produce an obvious labor of love. The former ice palace was awash with splendor. The chandeliers and candelabras glowed accordingly. Scenic elegance was provided on stage by the S.F. Opera's set for La Traviata. Red carpeting covered the wine-and-vomit-stained main floor with dinner. Throughout dinner, the patrons could trip the light fantastic to the smooth strains of the Berkeley Promenade Orchestra. After-dinner doping spelled the fashion show and Dave Alexander's blues piano counterpointed "Tales From The Muir Woods." By about 9:00 p.m., the audience had tired of attempting the Golden Gate Park Be-In Two-Step to classical syrup and bombast. The media vultures were poised. Questions, advance reports and rumors flew through the hall until the lights dimmed and the cameras whirred into action. "Let them retire every week!" said Bill Graham. "This could only happen in San Francisco!" All pontification became meaningless as the Band strolled through golden columns to their instruments. From the first chugging bars of "Up On Cripple Creek," it was evident that they had come to merge myth and reality. Over the course of a dozen of their most famous songs, the Band forged the most pwoerful performance they may have ever given. I have never seen any musicians play with so much vengeance and yet such economy and empathy. Every solo statement and instrumental fill, from Garth Hudson's liquid organisms and sweet sax to Robbie Robertson's succinct guitar work, was masterfully realized. Levon Helm's vocals were warm and rich and his drumming was inspired. Rick Danko was steadfast on the bottom and sly upfront. Richard Manuel was the moving interpreter he's always been; one of rock's great voices. The first of the peerage to celebrate with the Band was the ebullient Ronnie Hawkins. "Charlie Daniels! Hey, Charlie!" shouted an ecstatic 17-year old. Sorry, kiddo. It was Ronnie and the Hawks doing "Who Do You Love?" Robbie launched into his solo. Hawkins clutched his heart and fanned the guitar with his flop-brim cowboy hat. The ultimate tribute from the legendary Band-leader. Dr. John offered a well-chosen rendition of "Such A Night" and smiled behind his shades. Bobby Charles sang "Down South In New Orleans" while Garth added zydeco flavorings on accordian. The phenomenal Paul Butterfield put the breaks on "Mystery Train," stopping the show with some primeval evil on harmonica. Devastating, Muddy Waters, directing his take of "Caledonia," infused Butter with the spirit of Little Walter. "I'm A Man" was a steady blues litany, Muddy's signature hoochie-coo. Next out of the box was the velvet-jacketed Eric Clapton. Strapping on an axe, he and Danko slackened the pace with "All Our Past Times," a country-ish ballad co-written for Eric's newest L.P. Disappointment was rampant at the lack of six-string fireworks, but suddenly he was the Clapton of old. Shuffling into "Farther On Up The Road," Robertson primed E.C. for the meanest dueling since Duane Allman and the Dominoes amped out. Derek can still shut 'em down. The screaming hordes were his testament. Eyes glazed and nose runny, Neil Young contributed an acoustic version of "Helpless" with the Band on chorus harmonies. A tribute to their common Canadian origins. Fellow Canuck Joni Mitchell, in thrift shop calico and leotard, had the consummate chutzpah to perform three songs off her latest album rather than something more fitting. When Richard Manuel began "An Irish Lullabye," it was inevitable that Van Morrison should join in. Morrison, who recently returned to the British Isles after a number of years in Marin County, was positively electrifying (maroon rhineston-encrusted leisure suit notwithstanding). During the midnight intermission, local natural resources were tapped in the form of the Bay Area's poetry colony. The lights went down again and an eerie sound radiated from the stage. Would Dylan show up and walk across a vat of white wine? The word was that he had imported the baked salmon for the vegetarians, so he was surely present. But, it was only the organ intro to "Chest Fever" ... The Band cooked through that favorite, debuted "The Last Waltz," a lovely trifle written for the occasion, and of course, performed "The Weight." They were marking time until they introduced "one more very good friend, Bob Dylan." A white Borsalino lowered over his eyes and a leather jacket evoking his old James Dean-isms, Dylan vamped into "Baby, Let Me Follow You Down." It recalled interpretations from the last Dylan/Band tour with its careening arrangement and boundless energy. Sliding into a ballad, chock full o' angst, and then moving to "I Don't Believe You" from Another Side of Bob Dylan, Zimmerman showed that the old arrogance was justified. For "I Shall Be Released," The Band brought all the heavies back to harmonize and added a Beatle and a Rolling Stone for extra texture. Ringo sat behind the second drum kit and Ron Wood plugged in next to Clapton. The effect was boggling. A spontaneous jam evolved out of Ringo and Levon making like Sandy Nelson's "Let There Be Drums." Ex-Domino Carl Radle picked up a bass and Bill Graham carried Clapton back onto the stage. Graham then pushed a totalled Neil Young out front and handed him an electric guitar. 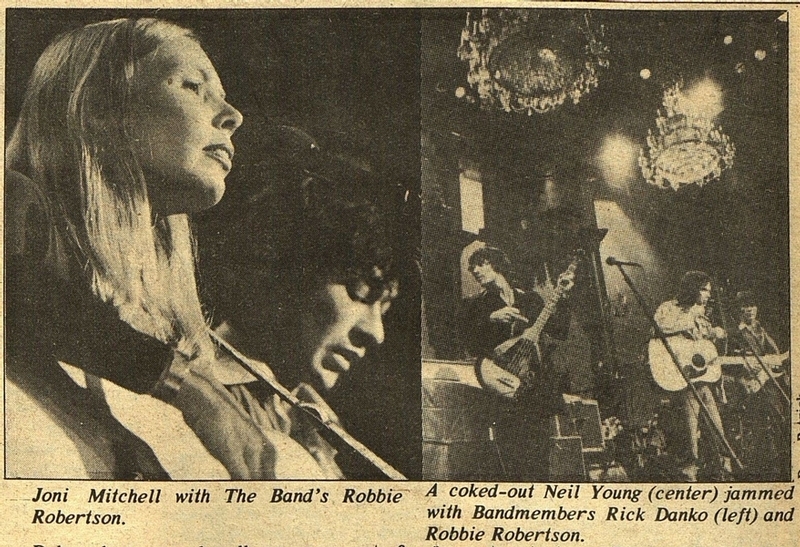 Young, Wood and Clapton started in on the Bo Diddley rhythm and let the evening's MVP, Robbie Robertson handle the lead. A second improv brought a chunky Steve Stills out to rumble with Young and Wood, while R.R. split to unwind. Musically, the two jams weren't really up to snuff, but on sheer personality power, they left the crowd stunned. The 15-minute ovation coerced the Band into a final encore, "Don't Do It," that more than sated the people. Roberson toasted everyone with a sip of Heineken's and said "Good night." An understatement, Robbie. This article has been viewed 1,816 times since being added on July 30, 2016.